Even though its location on Capitol Avenue has only been open for less than two years, The Southern Gourmasian is still a pretty firmly established restaurant. Years of building a fan base with its food truck business have resulted in a menu filled with fan favorites that aren’t going to change anytime soon. So it’s understandable that executive chef Justin Patterson and manager CC Key aren’t about to make wholesale changes to the dishes they offer. Still, the two have stretched their creative muscles as of late, and some of the new dishes from The Southern Gourmasian over the past six months have been well-made and fitting with the restaurant’s theme. And this week, The Southern Gourmasian has launched a new menu with several dishes you just can’t find anywhere else. I sat down with Key recently to talk about some of the changes for the spring menu. Of course, The Southern Gourmasian has always been a balanced hybrid of Deep South and Far East, but Key believes the new dishes are pushing the menu more into Asian territory. “Light” is definitely the theme of The Southern Gourmasian’s first new appetizer. It’s a Beef Bulgogi made with a sweet Korean barbecue sauce and red chiles that the guest spoons onto bibb lettuce to create a handheld appetizer good for two people. The tender beef and the fresh crunch of the lettuce are a pleasant combination, and the pairing speaks to another goal Key has for The Southern Gourmasian in the new menu. You’ll certainly want to bring a friend for the big flavors of the Okinomiyaki appetizer. This is a pair of vegetable pancakes topped with tuna crudo and a robust garlic and mustard elixir that Patterson calls “ninja sauce.” Be warned: you must love mustard to enjoy this dish, as the flavor is intense and can be overpowering. However, the cool tuna and the interesting pancake keep things from getting too much out of hand. If you’re looking for something extra light for lunch or dinner, the Thai Glass Noodle Salad is going to be right up your alley. Picture a cold Pad Thai, and you’ve basically got it. The salad is dressed with a fish sauce and mirin vinaigrette, and adorned with red bell peppers, Thai basil, peanuts and cilantro. The dish is designed as a vegetarian plate, though you can pay extra to add chicken or shrimp. One of The Southern Gourmasian’s most beloved dishes is its hot take on chicken and dumplings, and now those extruded rice dumplings are available in a less spicy dish. 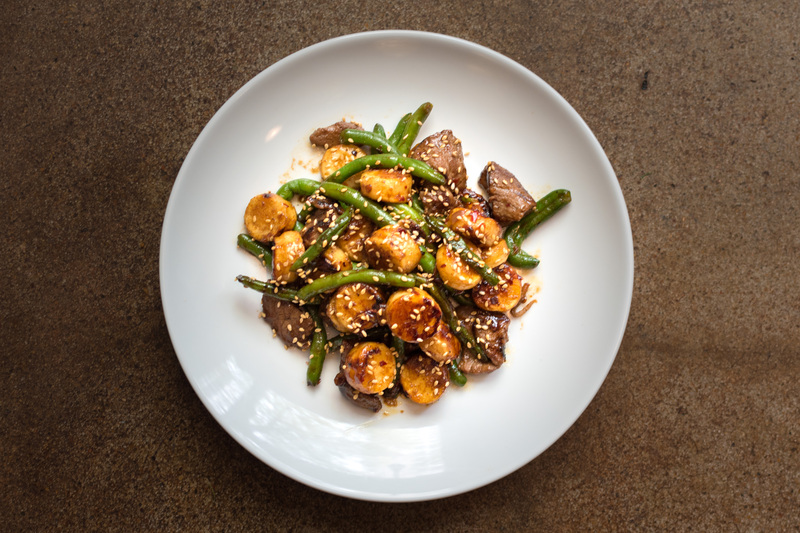 The Shaoxing Beef plate is named for the Chinese cooking wine that it simmers in before hitting the plate, and the combination of green beans and those excellent dumplings makes for a memorable dish. Key says this plate was created to make the dumplings available to a wider audience. Finally, the last new dish on the menu introduces Little Rock a national food trend that hasn’t caught on here yet, but hopefully will. The Southern Gourmasian now has two varieties of tuna poke bowls on the menu. If you’ve never had it, a poke bowl is a Hawaiian salad of raw tuna, scallions, soy sauce and a few other ingredients served on a bed of rice. 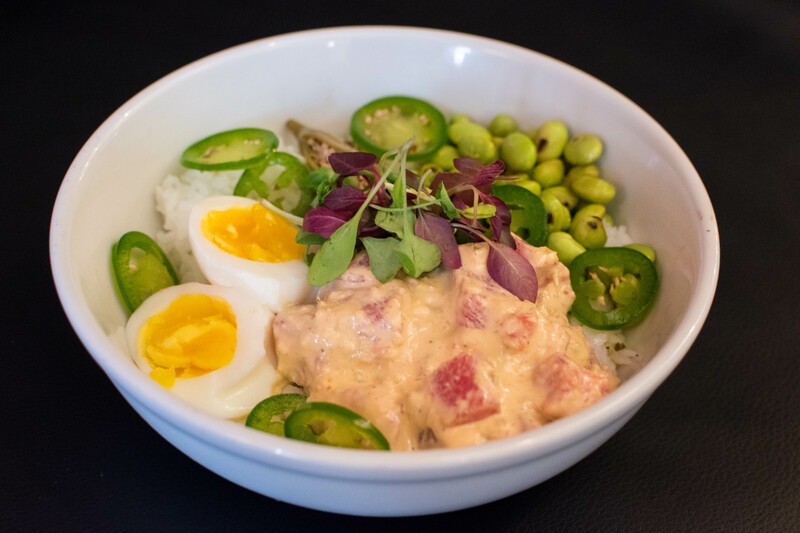 You can get it served in a more traditional manner with fresh vegetables, Thai basil and lemongrass, or you can opt for a tuna remoulade poke bowl. This one is fantastic, with an ultra-light remoulade dressing, toasted edamame, a soft-cooked egg, pickled okra and fresh jalapeno. This to me was the best example on the new menu of The Southern Gourmasian’s style. It hits Arkansas and Louisiana flavors in a Hawaiian dish with Thai and Chinese ingredients. It doesn’t hurt that it’s just delicious as well. This is one I really hope catches on. If you are a regular at The Southern Gourmasian, nothing above will really surprise you. The new menu continues the restaurant’s penchant for innovative yet approachable plates that always manage a beautiful blend of two distinct styles. If you are still waiting to go, I urge you to visit soon. Whether you try one of the new dishes featured here, or order up some steamed buns or ramen, you owe it to yourself to try out one of the city’s better restaurants.